How to Redo Your Pantry on a Budget in One Day! Replacing the wire shelving in our pantry with adjustable shelves has been on our to do list forever, but it's one of those home improvement projects we kept putting off. 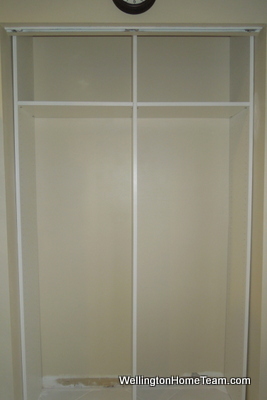 I thought about hiring a closet organization company, but after making over our garage I knew we could finish this project within a few hours and save a ton of money. So off my husband went to our local home improvement store to buy the supplies while I prepped the pantry. 3 White Melamine Adjustable Side Panels 3/4" x 12" x 97"
3 White Melamine Shelves 3/4" x 12" x 97"
1. I removed all of the food from the pantry. 2. Then I removed all of the wire shelves. 3. 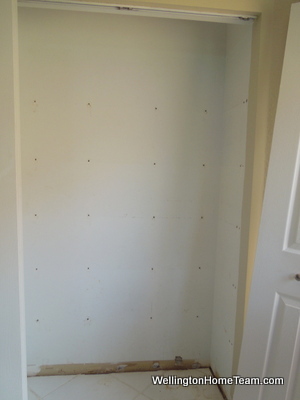 Once the shelves were removed I patched the holes and painted the walls. 4. My husband cut the 3 white melamine shelves into 12 shelves. We didn't need to cut the 3 white melamine adjustable side panels because they fit perfectly against the pantry side walls and down the middle. 5. We installed the new shelving by putting the 3 adjustable side panels into place, one on each side of the pantry wall and one down the middle. This part took two people because we did not secure the panels to the pantry walls, so the center one had to be held into place. Once that was complete we added the top and bottom shelves to press fit everything into place and then added the remaining 10 shelves. 6. Lastly, the baseboard was installed and painted. We had most of the supplies, so redoing our pantry was around $150.